Everyone has that movie – you know the one I’m talking about. You watched it over and over again as a kid, loving every minute of it… and then you grew up. Said movie disappeared, either sold at a yard sale or recorded over (talking some VHS nonsense here) or just plain lost. Years passed and you forgot that this piece of your childhood ever existed, until one day it’s mentioned at a party or you see a clip on Youtube or flipping channels. Then it’s a joyful act of rediscovery! Right? 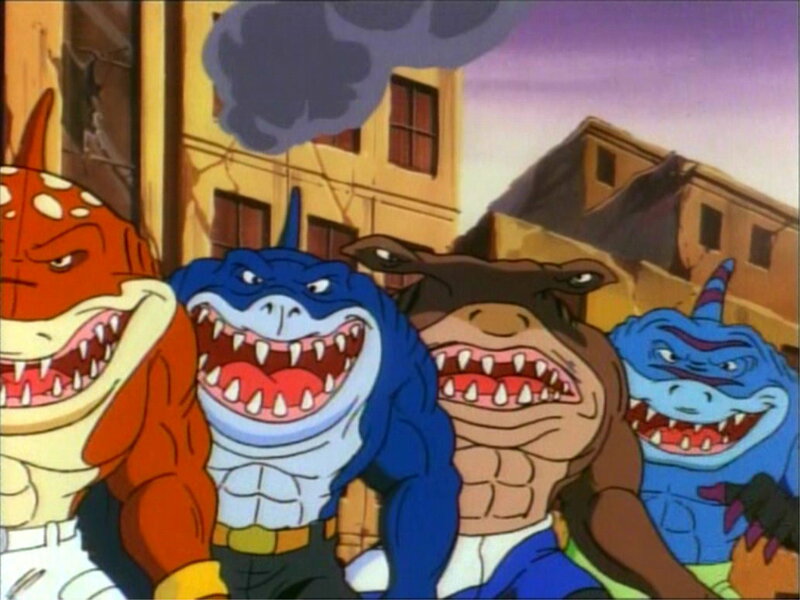 Stay dead, Street Sharks! You’re the poor man’s Ninja Turtles… and that is saying something right now. The movie also features this. I believe it speaks for itself. What the f*ck am I watching? Yes, We’re Back! is incredibly creative, which is probably one of the things that made it so appealing to children – that and dinosaurs. Watching the film today, however, is a different experience all together. Is it still creative? Sure – but let’s get to the plot. 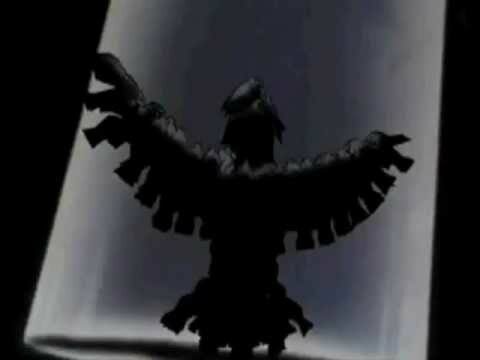 Okay so the movie opens with young birds in a nest. One of the birds is getting picked on by his siblings and wants to leave the nest (he’s going to run away and join the circus – a logical career move for a bird). Out he goes onto a branch and, regrettably, it’s not long before he topples off. 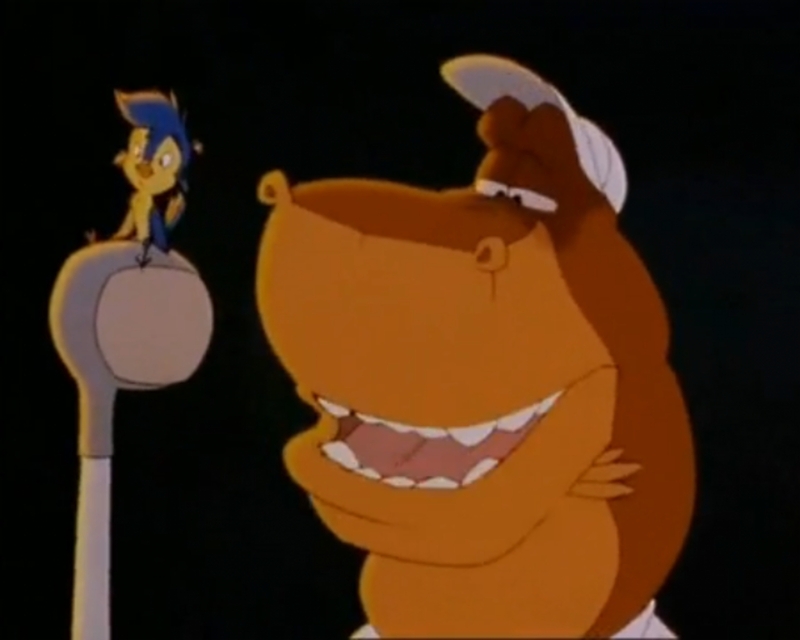 But that’s okay because he’s saved by Rex (voiced by none other than John Goodman), a dinosaur who’s playing golf. No no, we’re nowhere near strange yet. Anyway, so John Goodrex has some advice for the would-be run away. He tells him the story of another little boy who ran away to join the circus. But of course, he can’t start the story without explaining a couple of big questions – how did he get to present day New York and why is he so smart? Okay, so Rex was your average dumb T-Rex. He ran, ate other dinosaurs – all that good jazz. Then his alien named Vorb (voiced by Jay Leno) comes down and snatches him up into this flying ship thing. Vorb gives him “Brain Grain,” a breakfast cereal designed to make him smarter! It also makes him look more cuddly and gives him the ability to talk! Shortly thereafter, Rex is introduced to the other dinosaurs who have been genetically modified. There’s a triceratops, a pterodactyl, and a… an… a duck-billed thing (probably an edmontosaurus). They’ve also been given Brain Grain and now spend their days eating hot dogs… cause why not? Anyway, that’s the basic introduction. 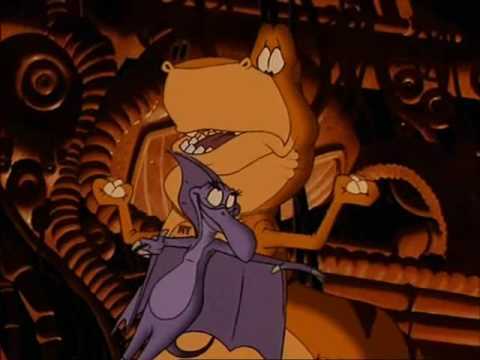 One thing I will mention now (that I never noticed as a kid) is how much the pterodactyl hits on Rex. She seriously has several bizarre lines and seems to get off on him checking out her “wingspan.” Now, I wasn’t there in the days of the dinosaur but… pretty sure the Bible says something against inter-dinosaur romance – check Leviticus. No means no, regardless of species involved. The Dinosaurs are introduced to Captain Neweyes (voiced by Walter Cronkite – not kidding), the man who invented the Brain Grain and the time-traveling flying spaceship that they’re all on. 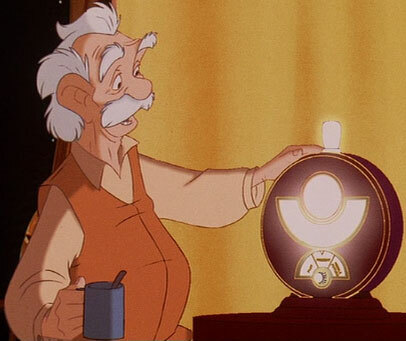 Captain Neweyes has also invented a “wish radio” that he uses to see what people want. 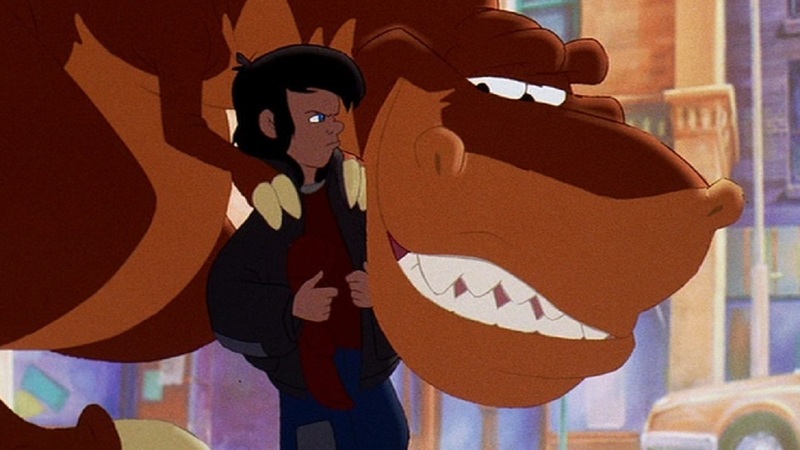 What people want in the 90s is apparently dinosaurs (a way to solve world hunger would have been great too – Captain Neweyes is kind of a jerk when you think about it). This man could stop Hitler if he wanted to. So, the Captain’s plan: bring dinosaurs to modern day New York and then air-drop them into the city. Tell them nothing about the world besides that they have to go to the Museum of Natural History and to avoid his evil brother, Professor Screweyes (a time traveler who uses his amazing technology to run a circus). Sounds like a great plan, what could go wrong? Oh, right… dinosaurs in New York. Of course, the dinos meet up with two kids who want to go to the circus and get sidetracked with Professor Screweyes. The Professor possesses his own “Brain Drain” that can de-evolve people… why is he just running a circus again? I won’t spoil the ending… let’s just say it involves a feast for crows. What a weird movie. Seriously, I can understand an animated movie about dinosaurs. Who doesn’t love The Land Before Time? But… really? Why… everything else? Turns out this movie is based off a book (so it wasn’t entirely the crazed director’s ideas), but the movie adds in characters like Captain Neweyes and Professor Screweyes. To be fair, it’s not just the plot that’s strange. The cast is a bizarre collection too. At the time, John Goodman had never done animation before, and Walter Cronkite was never known for voice acting. Oh, Julia Child is in this too as the museum curator. Again: why not? 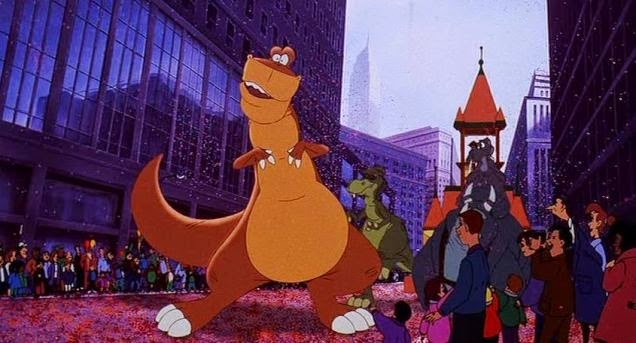 Fun fact: during the parade scene, there is numerous advertising for Jurassic Park. Parents objected to the material and were promptly ignored. Is the movie good? It’s… hard to say. You’ll be entertained, I can guarantee that. It sure is creative. If one can ignore all the problems (and there are many) that come with time travel, there is fun to be had. It is an odd movie… a really odd movie, but one with a heart, even if that heart is lusting for inter-dinosaur romance. What the f*ck am I watching: We’re Back! A Dinosaur’s Story. OH – BEST PART: the whole thing is on Youtube. Enjoy! I loved this movie when I was a kid! It was only until recently that I realized how strange and creepy it actually is. I mean, you know a movie is weird when you can’t remember the name of it and end up googling “creepy dinosaur circus movie” and it comes up as the first result.